A Little Something Different is aptly named. It's different from anything else I've read. But not really different. Just a little bit different. 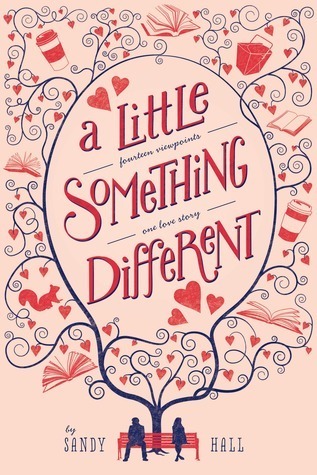 At its heart A Little Something Different is a conventional YA romance, but it is told from the perspectives of those observing the couple. The book technically falls in the New Adult category, given that the characters are in college. But I think it has more of a YA feel. The romance is very innocent. Actually, there's hardly any romance. It's all in the chase. I loved the constant will-they-or-won't-they feel to the novel. Thankfully, it didn't get old. Their relationship progressed or failed to progress in very natural ways. Gabe and Lea kept encountering each other, but realistic roadblocks got in the way (Lea assumed Gabe was gay; Gabe suffered from crippling shyness). I liked both Gabe and Lea. They are both very normal. Shy, introverted, fairly laid back. Neither are particularly memorable people, but I think their characters represent the everyman. Most of the readers are nice, normal girls looking for nice, normal boys. We can easily imagine ourselves in Lea's place. What really sets this book apart is the perspectives. It is told from 14 different viewpoints, including a squirrel and a bench. I'd never read anything like it, but it did a remarkable job of showing their relationship grow from the outside. It had just as much emotional impact as it would have if I was seeing things through the lovebirds' eyes. Perhaps even more, because it was novel. My favorite perspective was Gabe and Lea's creative writing professor who prided herself on picking out prospective couples each semester and surreptitiously pushing them together. Her matchmaking and frustration at the slowness was hilarious. I also loved Victor, their jerk-wad classmate who was stuck sitting between them and hated them both. He added a unique perspective and even developed himself as a character throughout the novel. Then there are the gimmick perspectives: the park bench and the squirrel. These toed the line between cute and stupid, sometimes crossing over to the stupid side, but I admire the author for the audacity of their inclusion. The only part of the book I really didn't like was Gabe's "big secret." There's something that keeps him angsty and reserved throughout the book. I didn't think it was nearly as big a deal as he made it into. I was expecting a dead girlfriend or a smothered puppy or something dramatic like that. His ordeal was a big deal to him, obviously, but not the dramatic twist that I typically read in YA. Perhaps it's better that it isn't over the top, but I still thought it got the angst-ometer up for nothing. A Little Something Different is a delightful romance. It basically tells a story you've heard a million times before in a format entirely new. It's also a very light read that flows smoothly and quickly despite the many perspectives. Gabe and Lea's relationship is subtle and sweet. Definitely deserves to be Swoon Reads' first publication. Recommendation: Buy if you're a big fan of cutesy romance. Thanks for sharing your thoughts. It sounds great. Oh wow, I hadn't heard of this but it sounds really interesting! I'll have to check it out. Organizing the house includes profoundly cleaning the premises, de-jumbling and masterminding decorations so the house can look engaging however much as could reasonably be expected.